Mike Harris, a Traverse City urologist, is among a growing number of physicians and dentists who no longer deal directly with insurance companies. 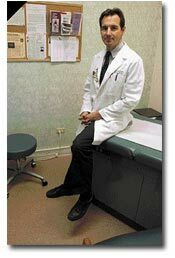 Mike Harris is a hard-working urologist whose procedure for radical prostatectomy has been copied around the world. But lately he�s been doing something distinctly unusual. He�s been playing football with his kids in the evenings. Going to his daughter�s basketball games. Leaving work at 5 p.m. to go Rollerblading instead of staying at the office until 10. And all because he no longer accepts insurance of any kind. No Blue Cross/Blue Shield, No Medicare. No Medicaid. Zip, zilch, nada. Patients who come to his practice � the Northern Institute of Urology � are told flat-out that he expects payment in advance for his services. And some of them do. Since Harris cut his last ties to the federal Medicare program a year ago, his patient load has been cut nearly in half. Where he once saw 25 to 35 patients a day, he now sees 12 to 20. His income, too, has gone down � but not as much as many people might think. When he stopped dealing with public and private insurance, he was able to slash 25 to 30 percent of his administrative costs, pass some of the savings along to his remaining patients, and still come out ahead. Harris isn�t alone. At a time when political candidates and editorialists are pressing to have health insurance expanded to more sectors of the American workforce, he and a growing number of other health professionals � in northern Michigan and around the country � are going in the opposite direction. There�s even a national group, the American Association of Patients and Providers, urging practitioners to stop acting as �middlemen� between patients and insurers and start doing what they were trained to do. �In the future, I think the majority of doctors will be doing this,� said Traverse City dentist Michael Hutchison. In June, he and his partners at Associates in Family Dentistry ended most of their insurance participation and they�re slowly working toward complete independence. They�re one of several dental practices in the region that now operate at or near a complete �pay as you go� basis. Like almost everyone else in the health care industry, Harris, Hutchison and their insurance-free colleagues believe something is seriously wrong with America�s health system. But the cure is not more regulation, they say � or even more insurance. Health insurance isn�t even insurance, said Harris, but �prepaid health care� that costs far more than most people actually receive and encourages wasteful consumption habits. As an example, Harris cites the experience of SimpleCare, a program formed in the state of Washington by a group of physicians who stopped accepting commercial insurance three years ago. The practice had been steadily losing money and was about to file for bankruptcy when the doctors decided to offer lower fees to patients who were willing to pay cash. The idea caught on in a big way. Patients without insurance suddenly found themselves competing on an even field with insured patients; instead of being charged $79 for a 10-minute office visit, they pay $35. Patients who can�t pay are treated anyway, but are required to work off their debt by performing community service. Since 1998, SimpleCare has grown to include more than 600 physicians in 38 states, and its founders are trying to persuade employers to switch their conventional health insurance to a combination of high-deductible coverage (for catastrophic illness) and medical savings accounts that employees can use to pay for routine health services. Such a system, they argue, could save money and help companies regain control over spiraling health-care costs. Harris�s own �declaration of independence� began in 1996, when he stopped dealing with the Medicaid reimbursement program because the administrative costs he paid were higher than the amount of money he took in. But he remained dissatisfied with commercial insurance carriers and HMOs, particularly after the advent of a cost-control strategy called capitation, where physicians are paid a set fee for every patient, whether they treat that patient or not. To Harris, the practice was inherently unethical, and by 1998 he had severed his relationship with the companies. At the end of 2000, he began withdrawing from Medicare, first by becoming a non-participating provider and finally opting out entirely in late 2001. It was a risky move, since the area�s other three urologists accept Medicare. All the same, 40 percent of Harris� current patients qualify for Medicare but come to him even though they know they won�t be reimbursed. Not that he hasn�t lost a good many patients. Some people who once went to Harris now drive as far as Petoskey or Cadillac to find a physician who will process their insurance claims for them. He�s bringing in less money � but he�s able to spend a lot more time with his patients. Traverse City dermatologist Mark Saunders has never worked with commercial insurance, and he�d consider withdrawing from Medicare, �only I don�t know how to get out of it.� Like Harris, he estimates that he loses five to 10 potential patients a day because he won�t accept their insurance, but feels he can sleep better at night because he doesn�t feel the pressure to cut corners. Hutchison has had the same experience at his dental practice. The problem, he said, is health insurance has encouraged consumers to act as if such things don�t need to be paid for � even though they�re usually paying far more in premiums than they�re ever likely to receive in services. Like other health professionals, dentists end up spending anywhere from 25 to 30 percent of their budgets paying someone to submit claims and follow up on them � and they�re the most likely scapegoats when a claim is rejected. �You have insurers who tell patients that we�re charging too much � and it�s been getting worse recently � and that�s the perception patients have of us,� he said. �Well, what do you suppose that does to the doctor-patient relationship? All we�re trying to do is provide them with the best quality care we can, but it�s not free. Harris says he�s talked to many other physicians who say they admire what he�s done and wish they could do the same. From the perspective of a low-income patient who�s entirely dependent on Medicare, that may not be such a bad thing, said Cadillac oncologist Stephen Reznicek. He and his colleagues are now caring for some of Harris� former patients, and they don�t feel they could simply back away from Medicare and leave those people in the lurch. But Reznicek, who�s still in his mid-40s, said he may rethink his position in 10 years or so. Harris maintains a Web site explaining how his cash-and-carry practice works, and laying out some of his thoughts about the future of American health care. It can be reached at www.northernurology.com. For information about the American Association of Patients and Providers, log on to AAPP�s Web site at www.aapp.net. Information about the closely related SimpleCare program can be found at www.simplecare.com.